Happy Birthday To My Sweet Mother in Law! Today my Mother in law turns 97 years old! Isn't she beautiful? 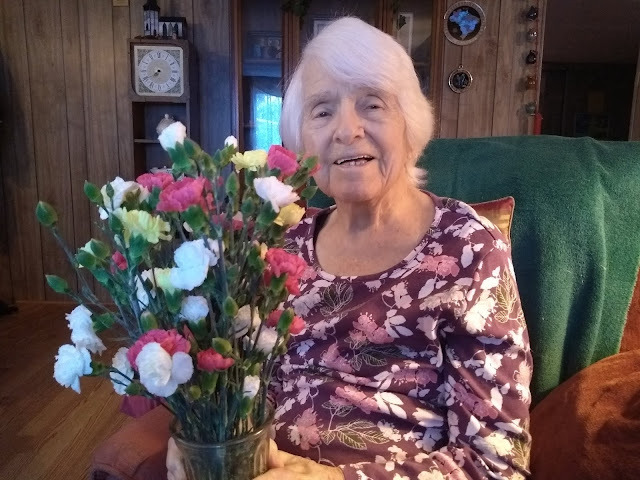 This is a photo of her yesterday holding birthday flowers. She's having several days of celebrating (a woman after my own heart!) with family and friends. Jean has had a amazing life. She was a mischievous child, often getting into trouble, gave her heart to Christ and walked and served Him all the days since. She worked for Youth for Christ in Canada (she's from Orangeville, Ontario for my Canadian friends) when Leighton Ford was still in high school, went to Bible School, and missionary training where she met Tim's dad. She was in her early 30's then. They married, and went to Senegal to work with people groups who didn't have written languages. She had 6 children, four boys, two girls. Two boys died in Senegal. She's Grammy to 15 and great Grammy to eight! We are going to tea today, so I am sharing five photos from my phone. 1. Last week the sunlight on these clementines caught my attention. 2. Wes sent me this photo of he and Rachel last weekend. Aren't they cute? 3. Wednesday night Sarah hosted a campfire for friends. It was pretty cold and after they had roasted all the s'mores they could hold, they moved inside for Jungle Speed. 4. This was my tree line yesterday in the morning sunshine! So beautiful! 5. My sister in law brought me a tin of tea from Fortnum and Mason in London. Of course I had to brew a pot yesterday morning. It is delicious and gave me the opportunity to bring out my sheep tea cozy! I love this guy! I hope you all have a delightful weekend. We are planning to go to a fall market and do some other shopping but we are supposed to get some rain. If its not too torrential or windy, we'll still go out! Of twisting vines and sturdy shrubs, Scarlet and yellow, green and brown, Falling, or swinging on their stalks, Is Sorrow’s crown. The sparkling fields of dewy grass, Woodpaths and roadsides decked with flowers, Starred asters and the goldenrod, Date Autumn’s hours. The shining banks of snowy clouds, Steadfast in the aerial blue, The silent, shimmering, silver sea, To Joy are true. My spirit in this happy air Can thus embrace the dying year, And with it wrap me in a shroud As bright and clear! Mom and I had a road trip to BWI yesterday to pick up my sister in law, Paula who is visiting from California. She came in to beautiful weather, with blue autumn skies and sunshine! We had dinner out last night in Oxford, Pennsylvania at the Sawmill Grill. It was delicious and we enjoyed hearing about Paula's trip to Kenya this summer with Robert (my brother) and other people from their church. Today, she and my mom and I are headed to Lititz to shop at Pebbles and Lace and the Wilbur Chocolates store. I may be able to talk them into a quick trip up to the Clay bookstore as well! And while we are so close maybe we'll drive through Middle Creek Wildlife Management area and see the trees. Sounds like a plan. I'm not going to get deep with this post, but I just wanted to share what's on my mind. Many days, I am blessed to speak, or text with all of our kids. I think that its from the family culture we built. Spending so much time together due to home education, and helping our kids build friendships with each other has contributed to this, but mainly we were intentional in our building relationship in the family. Don't think that our kids are tied to my apron strings, though I do have some cute aprons! No, Tim and I wanted to raise adults who would go out into the world and bring friendship and hope to those God brought into their lives. I learned to not hold on to them too tightly as they grew and began to spread their wings. I stayed interested in their lives, and encouraged them (mostly) on their way. I learned to stop parenting them and to be their friend, a listener and encourager, not a teacher as they became young adults and then adults. I hope you had a good weekend. We did. Tim and Kyle worked on splitting firewood and delivering a load to my parents, while I worked on my closet and made Chicken Tortilla Soup for dinner. Here are a few videos of my work in my room/closet. The white desk had been in my closet where the smaller table and mirror is now. I didn't touch any of Tim's things (yet) and I didn't sort through the bins, but I have some things to give away, and a bag of things for the trash. Why do we hold on to things that are stained, don't fit any more, or we just don't wear? My chicken tortilla soup recipe is basically the one Ree Drummond makes. I just tweaked it a little. Also I put sour cream and cheese in mine, so it looks creamy. I also add some tortilla chips (broken up) to it. So delicious. Sarah is headed to the Adirondacks today to visit Rachel for the weekend, and they're both happy about this! She'll get to stay in her dorm room, too, so that'll be fun as well. 1. Late afternoon in the living room. It still looks bright outside but evening was coming on. 2. Tim surprised me with these flowers this week. Its a lovely autumn bouquet! 3. A few weeks ago I brought this ivy inside from being on the table in my cottage garden. It has grown in this spot, it must have been too rainy in the garden! 4. We had a heavy frost advisory overnight so my aloe, my ficus and the begonia/coleus planting that Nate and Kay gave me for Mother's Day were brought inside. 5. I bought this at the store this week! I couldn't resist! I stopped in at a great store in a small town near to our cottage. 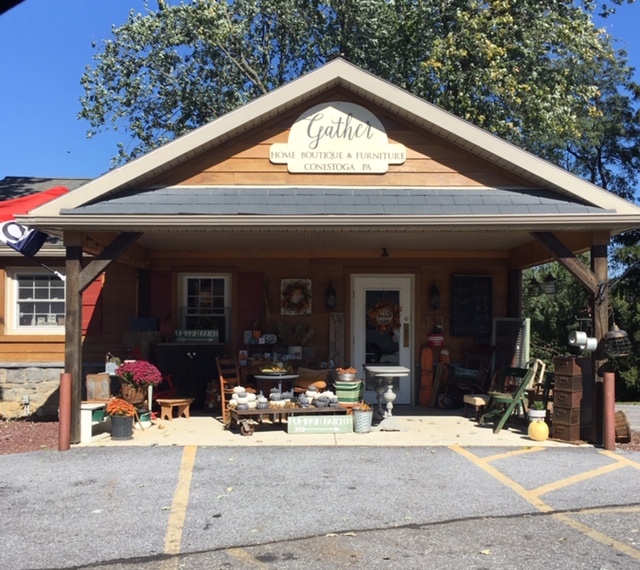 Gather Home Boutique and Furniture is a sweet place with lots of lovely painted signs and furniture, and other treasures for your home. An acquaintance friend, has a small section of this store for her business Found and Fresh. My friend showed a great mirror on her instagram page for Found and Fresh that caught my eye, so I went over there yesterday to check it out. I bought it, and a Christmas gift, but we won't talk about that yet! Here is the mirror in terrible light. This is a heavy wood frame, but I just love the way it looks, and I need to decide where to hang it. The issue with where is that Tim would like to keep the desk top in the living room, so we are looking for a cabinet for it. The likely place for that is my plate wall. Sigh. I watched the girls on Monday and Tuesday. When they are here I'm trying to keep a schedule of sorts, since that seems to work well with them. So first up, schoolwork for Kamryn (and Kyle) then lunch. After lunch we watch a moving during resting time. Klaire slept during resting time both days, but as long as she lays down, she doesn't have to sleep. She does, usually. I told Kamryn that after resting time, we'd have tea, and she held me to it! She picked out the tea cups, while I brewed the Chamomile tea. I put out a few cookies for them, and Kamryn put a few clementines on the plate, too. I like to incorporate some poetry exposure during tea time so I read Robert Louis Stevenson's Autumn Fires to them and we worked on memorizing it. Klaire just ate cookies, but Kamryn is well on her way to knowing it! In the other gardens and all up the vale From the autumn bonfires See the smoke trail. The temperatures have moderated and have been in the 50's, and though its been rainy still, I think that is going to change at least for one day this week! Autumn brings the delight of wearing sweaters, dressing in layers; with a cute dress, leggings and boots. Its clove and wild orange oil in the diffuser, and turning on ambient lighting as evening comes. I've been using little battery operated strings of lights in my jars and votive holders. It's so nice to have the light without having to deal with candles. I love going outside and having the cool air hit my face, and enjoy the scent of wood smoke in the air. I love the burning bush turning red, and the viburnum leaves going yellow. I saw the first of my neighbors oak leaves in our driveway this morning, and while I know this means a million oak leaves are on their way, I really don't mind. His tree will give us weeks of beauty to enjoy. When we bought our cottage, 17 years ago, we had many projects that had to be done right away. With a tight budget, and a fixer upper house, we didn't bother to change out things that were working just fine. Now we are at a place in life, and in the life of this house, that we have a list of 'small' projects we want to get done. Saturday Tim and I went to our local hardware store and brought home a new Delta low flow toilet. It has a nice profile and fits the space in this bathroom very well. The only issue is that with the smaller profile, the tank doesn't fit the exact space that the other tank did, and you can see the colors that our bathroom has been! Thankfully we had paint left over from this room and Tim quickly painted a coat over this space and then attached the tank and we were in business! Its the little things in life that are so satisfying, isn't it?